A surge of playing and coaching experience is coming to Asheville School’s Arbogast Field ahead of the 2017 fall season. Three new assistant coaches with coaching and college-level playing experience will join Head Coach Gus Schill and Assistant Coach Lecky Haller. Gill joins Asheville School after an impressive college career as a four-year division I player at Western Carolina University. Gill is a two-time All-America selection and racked up impressive stats during his time at WCU. A three-time Southern Conference Defensive Player of the Week, Gill was a unanimous All-Southern Conference selection during his senior year and finished with a career-best 111 tackles, including 51 solo stops. Gill is excited to coach at Asheville School. 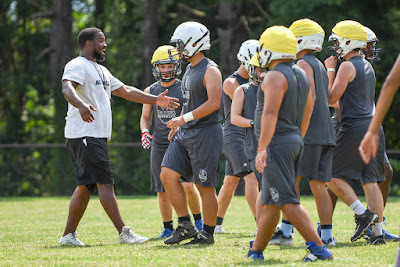 He has led the Christon Gill Football Camp in his hometown of Bridgeport, Connecticut for the past two years, and he is motivated to translate that experience to working with the Blues. “I am really looking forward to giving the kids what I learned—not only skills on the field but also life lessons that they can use in the future,” he said. Ben Williamson, who has extensive coaching experience and played as a walk-on for Auburn University, will coach the Blues’ offensive line. Williamson led the Greenies at Christ School from 2003 to 2008 and then went to coach at The Walker School in Atlanta from 2008 to 2012. Most recently, Williamson has worked as a dean of students, and he says he is excited to get back into the world of coaching. Geoffrey Strickland comes to Asheville School from Sewanee: The University of the South. He says that his playing experience has taught him how to train student-athletes, and he will stress the importance of helping players succeed not only on the field but also academically, socially and spiritually. The Blues will play their first game of the season at home on August 26 against Christ the King Catholic High School. For updates, follow Asheville School Athletics on Twitter @avlschoolsports<https://twitter.com/avlschoolsports>.